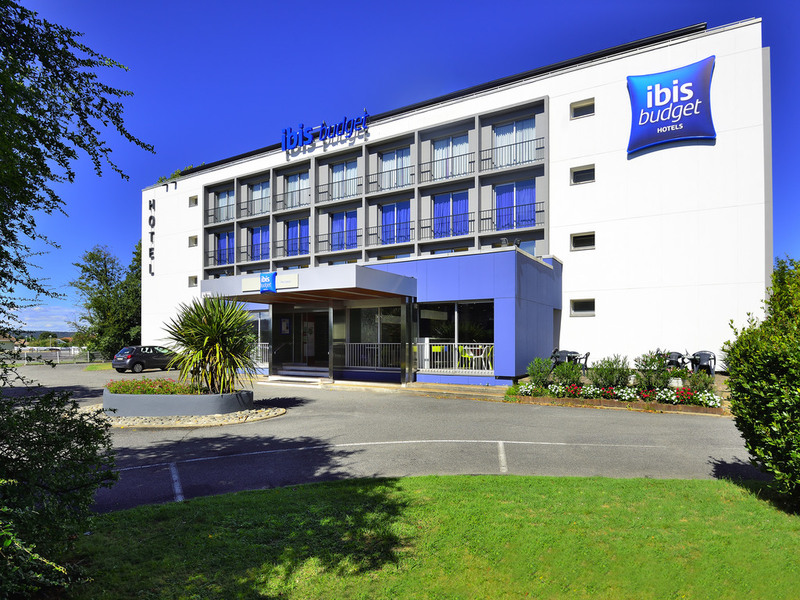 At the edge of the Pyrenees resorts and tourist routes, the ibis budget Pau Lescar (formerly Etap Hotel) is located 3.1 miles (5 km) from the historical center of Pau, and within easy reach of the exhibition center, university, racecourse, Zénith arena, s ports complex, golf courses and the Pau-Arnos racetrack. Take a break for 1, 2, 3 or 4 people at an affordable price. An economy hotel offering rooms equipped with shower, toilet, satellite TV and free WIFI. This fully air-conditioned hotel is located in a quiet area close to the medieval city of Lescar, only 547 yards (500 meters) from shops and restaurants and close to the expressway and A64 and A65 highways. Buses to the town center depart every 15 minutes from in front of the hotel. The hotel is located 15 minutes from Pau train station, 10 minutes from Pau Pyrénées Airport, 1 hour from the Pyrenees ski resort of Gourette and 45 minutes from the Notre Dame de Lourdes Sanctuary. Very good stay, room very good, breakfast excellent, staff very good. Check in was easy, and was really flexible between noon and midnight giving excellent flexibility. Room was adequate, bathroom was large, both were extremely clean, breakfast was plentiful. Just what you want for an overnight stay with no frills which was all I needed. The hotel has been nicely refurbished since my last stay and is very smart and comfortable. All facilities are very good, and breakfast was good value (fresh fruit salad was much appreciated). The manager, who is the same as on previous visits, is friendly, helpful and efficient The only negative was a smell of tobacco on the pillows. Very much like other Ibis budget hotels, flimsy thin prefabricated structure. Particularly in this one I could hear guests in neighboring rooms and the floor above. Having said that what had rude it worse was the extremely rude and unhelpful receptionist. I have never come across such service in any hotel anywhere in the world I traveled. The guy point blank refused to help because his shift was up so , he shut the computer down, packed his paperwork and walked away! leaving me flabbergasted at the front desk! When parking my car I noticed someone was sleeping in his van in the hotel car park presumably saving the cost of the overnight stay. I has a lot of valuable items in my car and this was rather concerning (may be wrongly so). however, the helpful receptionist did not even give me the time to voice my concern!! Hello, Further to your comment, I you reminder(abseiling), which you wanted to change room(chamber), I have you say not because the hotel was pleases all the hotels on in was complete, our reception is opened till 21 hours, I advise(recommend) you solemnly to go to Novotel, Mercury, I wish you good continuation. Perfectly acceptable budget hotel and convenient as a last stop in France before heading in to Spain (if you have the time take the D roads through the Pyrenees - spectacular scenery). Room was clean, bed was comfortable and shower was very good. Breakfast was cheap and very nice. Not the hotel's fault obviously, but there are very few places to eat within walking distance and the only alternative was a rather expensive vending machine. Overall we were satisfied with our stay. Easy check in good breakfast clean room. Well located hotel. On line check in works well. But pre authorI sing 10 euros from credit card as a result is inconvenient particularly when the room is pre paid It affects the cards credit limit and was not refunded for four days after my stay. Dear KENNETH M., We are really happy to hear that, and thank you for your sharing, we hope to see you soon in our hotel, thank you again and.. have a beautiful day! :) Sincerely, The reception. My wife and I are silver card members and we travel with a small dog, the majority of hotels in the Accor group allow the dog, at a charge, to stay in your room. The Ibis budget was the only one in Pau to allow this. The hotel is advertised as being in Pau but is situated about 10kms away from the town, very strange. As usual the manager at this hotel is always very helpfull and a good nights sleep even though the hotel was busy I think this hotel is very good value and the fact it takes animals as well is great out cat loves it. Found the hotel easily using satnav. It was in a quiet location. The room I stayed in was the most spacious I have had at an IBIS Budget, as was also the bathroom. I found the bathroom facilities better than in previous years, with an excellent shower. Nice room, good breakfast for its price. Was visiting with kids, and phoned to ask for a baby bed. Phone costs were 25 euros... Don't c. them!! Nice clean spacious room, with helpful staff. Very difficult to find and to get there. Did not appear on my car Sat Nav. More detailed information needed. Beautiful area but location not ideal. Friendly and helpful. Easy to book and organise. Helpful staff. Parking no problem. Breakfast great. Room comfortable. Would do it again. It was pleasant except that there was no shower chair for my wife who is disabled and we had to go to another Ibis hotel, nearby, to get an evening meal. Ideal cheap one night stay on our way to Spain. Hotel and room was clean, staff were friendly and curtious.